What is Decapeptyl (Triptorelin) used for? 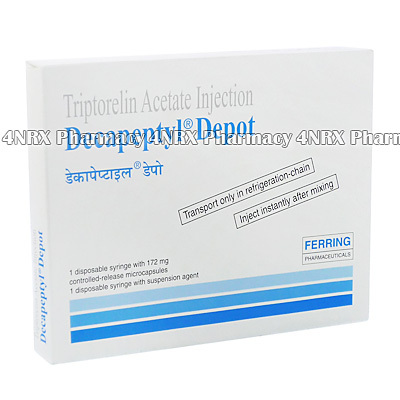 Decapeptyl (Triptorelin) is an injectable synthetic hormone prescribed to treat patients who are suffering from advanced prostate cancer, uterine fibroids, endometriosis, or premature puberty. The medication operates by over-stimulating the production of natural hormones in the body to prevent the release of those associated with the growth of tumours and cancer cells. This can slow the growth of tumours and prevent their spread allowing other procedures to be performed to remove them. Your doctor may also prescribe it for the treatment of other unlisted conditions. How should I use Decapeptyl (Triptorelin)? 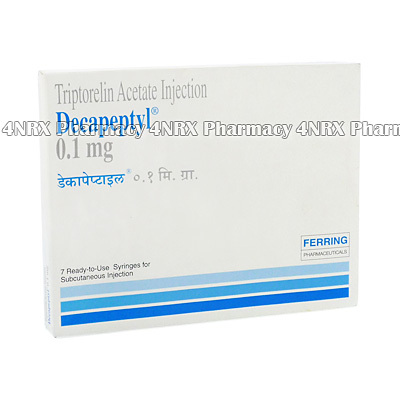 Decapeptyl (Triptorelin) should be used strictly according to your doctor`s instructions to get the safest and most effective results from treatment. The contents of one ampoule is normally administered once each month, but your particular directions will depend on your weight, age, health, the condition being treated, and the severity of your symptoms. The medication is normally injected directly into a muscle or vein by your doctor or a professionally trained medical professional. If you are required to perform your own injection, make sure you are fully instructed in the correct procedure to prevent potential health problems from occurring. Always sterilize the injection area prior to each use to prevent infection. Open one ampoule, collect its contents into the syringe, and slowly inject the medication. Always observe the medication before each use to make sure it is not cloudy or discoloured as this may indicated contamination. Ask your doctor any questions you have about the use of the medication to prevent potentially severe side effects or complications. What are the side effects of Decapeptyl (Triptorelin)? Serious side effects that may require emergency medical attention include fever, flu symptoms, difficult movements, numbness, tingling, bone pain, painful urination, urinary retention, chest pain, irregular heartbeats, or increased blood sugar. Tell your doctor about any worrying or intense symptoms to make sure the necessary adjustments are made to your application frequency or dosage to prevent further health complications from occurring. Decapeptyl (Triptorelin) should not be administered to patients who are pregnant, breastfeeding, men whose cancer has spread to the spine or spinal cord, or women who have unexplained vaginal bleeding. It is also important to inform your doctor if you have osteoporosis, are at risk for osteoporosis, men who are at risk for tumour flare, or men who have a urinary obstruction. These conditions may cause unexpected health problems requiring special adjustments to your regimen. Strictly use Decapeptyl (Triptorelin) as prescribed and follow all instructions provided by your doctor. Safe, suitable, and optimum dosage can vary and is dependent on the patient`s health and medical history, as well as the condition you are treating. Decapeptyl (Triptorelin) may not be safe or suitable for all patients. Always ensure your doctor is informed if you are pregnant or breastfeeding, using any other type of medication (including non-prescription medicine, vitamins, and supplements), as well as if you have any allergies, other illnesses, or pre-existing medication conditions.